There's a lot to like. It's small, lightweight, and unobtrusive, yet has a strong LED light and long-lasting battery. The soft, stretchable plastic housing wraps simply but securely around the walker's horizontal brace. You just push the button to turn it on. I push the button. It starts strobing like a Berlin disco. Dizzily, I push it again, and it relaxes to a slow blink. Once more and finally it's steady like a normal light. Fourth push to turn it off. Why does it have three modes? Why is the only obviously useful mode, the normal light, the third? Why does it strobe at all? Did they envision that the primary use of this light would be to alert oncoming motorists when elders walked their walkers along highway shoulders in the dark? Maybe they weren't thinking of the problem I thought they were thinking of. My grandma tries to turn it on. She pushes and pushes but nothing happens. Maybe she's pushing in the wrong spot. Can she find the button? It's the same blue color as the rest of the device (in the photo above we had already painted it with nail polish to make it stand out). With no color contrast, the only hint that it's a button are some tiny ridges in the plastic. Alas, she can't feel the ridges - peripheral neuropathy has rendered her fingers mostly numb. And you actually need to push pretty firmly right in the center. She can't push hard enough with her finger. She finally gets it by pressing in the middle of our paint job with her fingernail. She seems undeterred by the strobe, but it still takes her a while (and quite a bit of concentration) to cycle through to the "steady light" mode. She wonders aloud if she should keep a screwdriver in her walker pouch to help turn it on. I'm imagining someone with poor vision, numb fingers, and urgency desperately trying to get this darn thing to turn on in the middle of the night while their bladder holds out. My grandma, fortunately, has a bladder of steel. She took the gadget home to try anyway. I advised against the screwdriver. So much about this gadget is right. It's cheap, simple, and might effectively help with a real problem. But it's done in by the little things. It should have a big, raised, brightly contrasting button that doesn't require much force to push. Maybe even have the button glow in the dark. And it should have two modes: on and off. My grandma could have told them as much. I can't help thinking that the manufacturer never had anyone over 40 try to actually use it. 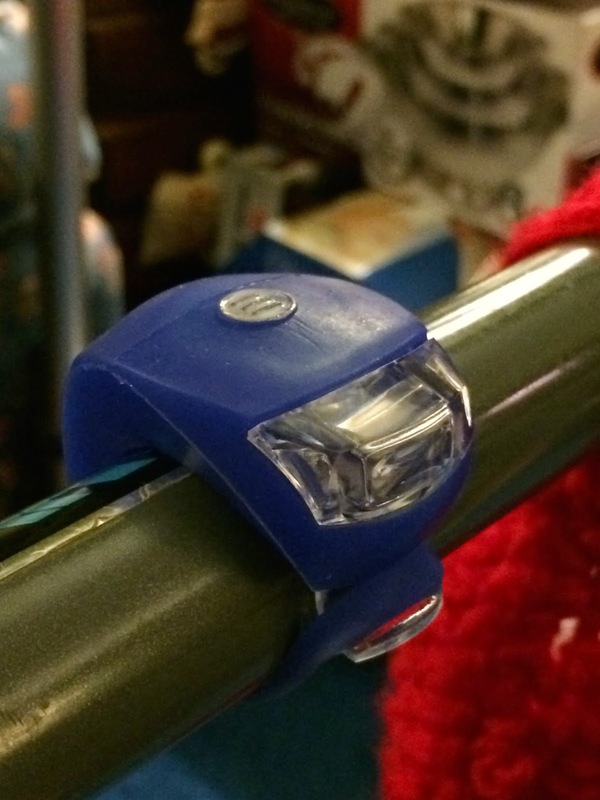 Yet it is specifically marketed as a "mobility light" for "mobility aids". What are the lessons for tech mavens striving to fix our elders? Keep it simple. Test your product with the same elders you think might use it. If you're making a product for a walker, test it with elders who use walkers. Account for weakness, tremors, and sensory impairments. Good intentions and even good ideas are not enough - it's the little things that really count. Two days ago in the podiatrist's office, I sat far too long on poor therapy chairs. Pain. The water therapy basin left my legs dangling - nothing to rest feet on to save short legs from pain. Yesterday, when I was told to come in an discuss some side effects of therapy, I got the new, expensive chair. It is so wide that I coudn't rest my arm on both sides at once. A BARIATRIC CHAIR. There is no chair in that office that allows my feet to rest on the floor as Mayo Clinic recommends. But there is an amazingly expensive BARIATRIC CHAIR. Would someone with GeriPal's audience please fight for adjustable chairs for people whose legs are not long (we also need less chair depth when our legs are not long above the knee. Great post, fun to read. I'm in the Bay Area too, where there is general enlightenment about the importance of good user-interface design. I agree with your lesson for the tech mavens: keep it simple -- and to that I would add, design teams should include social scientists or interface designers. Or at least managers who've read Don Norman's books or "100 Things Every Designer Needs to Know About People."